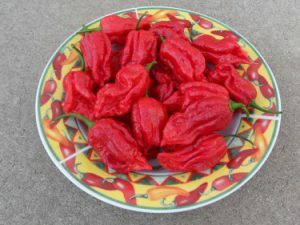 You are purchasing 6 dried de-seeded Trinidad Moruga Scorpion peppers. Even though these are packaged intact they can get crushed during transit. The Moruga Scorpion (Capsicum chinense) is from the Islands of Trinidad and Tobago. 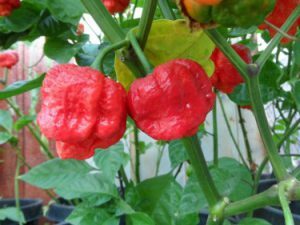 It was formally announced on February 6, 2012 at the Chile Pepper Institute Leadership dinner to have tested at a high of 2,009,231 Scoville Units. A new world record! The seeds for this study were from my plants. 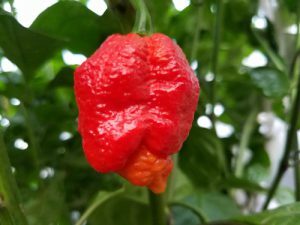 The average heat of all testing combined for the Moruga Scorpion was 1,207,764 Scoville Units. So what you grow could get over 2,000,000 but most likely will be lower than that. Same as other records. The records always show the highest number but that is not the norm or average. We don’t know why, but this chile has been named after the district of Moruga which lies on the central south coast of Trinidad at the western end of the Trinity Hills. It is in Victoria County. Oddly enough this is the area where Christopher Columbus first landed. The chile has been found growing both on Trinidad and Tobago. 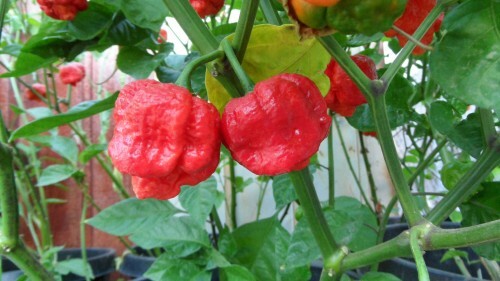 It has a slight Scotch Bonnet shape but does not usually grow a small slender tail like the Trinidad Scorpion. 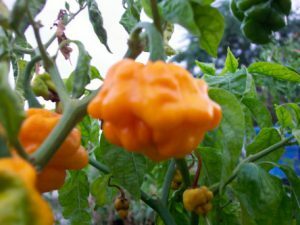 Pepper pods are much larger than the Trinidad Scorpion and are more consistent in shape and size than most Trinidad superhot varieties. The surface of it’s outer skin is rough and pebbly like the Trinidad 7 Pot chile varieties and one would say it looks like the texture of the human brain. Average size of the pods is slightly bigger than a golf ball. These peppers are loaded with Capsaicin and you can actually see droplets form on it’s extra thick placental tissue after cutting the pepper open. The flavor is described as fruity and floral and heat builds long after eating. Plants average over a meter in height and are very productive. I started growing my first plants in 2009 with seeds obtained from a chile hobbyist in Europe. I have selected my seeds from the best pods and plants over the last three years.